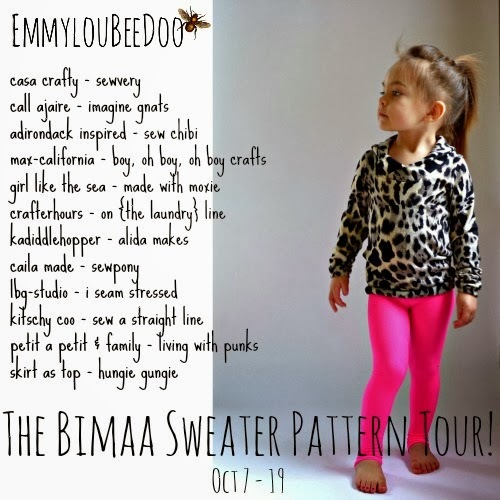 When the lovely Sarah from EmmylouBeeDoo asked if I’d like to hop on the Bimaa Sweater tour I didn’t hesitate to say yes. I have loved the other patterns I’ve sewn of hers and knew from seeing all the fun Bimaas pop up in the southern hemisphere last spring I would fall in love with this one too. And I did! There are multiple versions of the sweater at the neckline including an amazing looking hood, but I decided to go cowl. 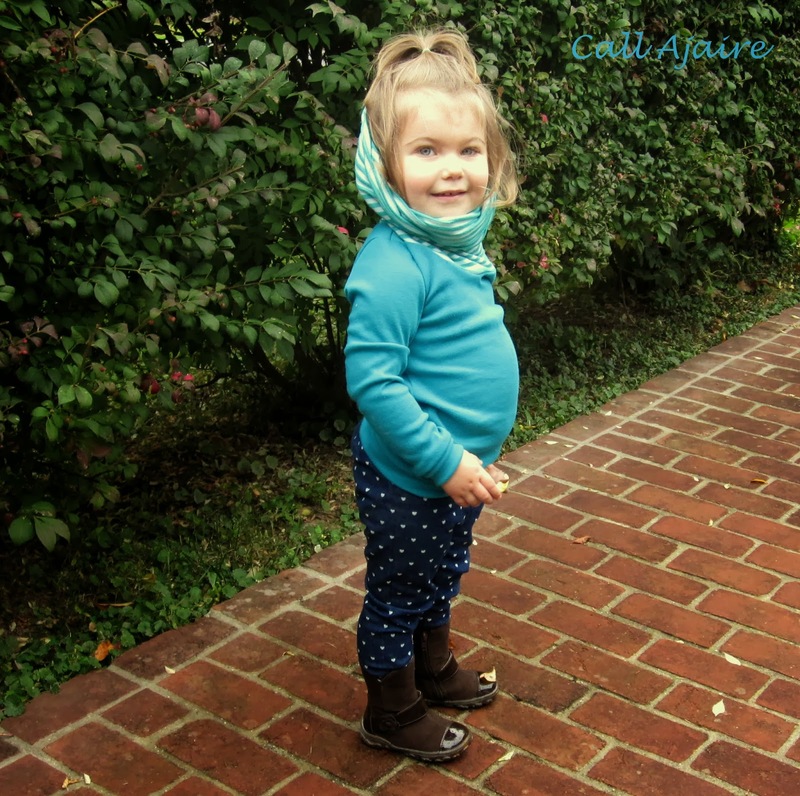 Last fall I was obsessed with cowl necklines on Bean, but I never had the guts to go over the top with it while I was drafting. 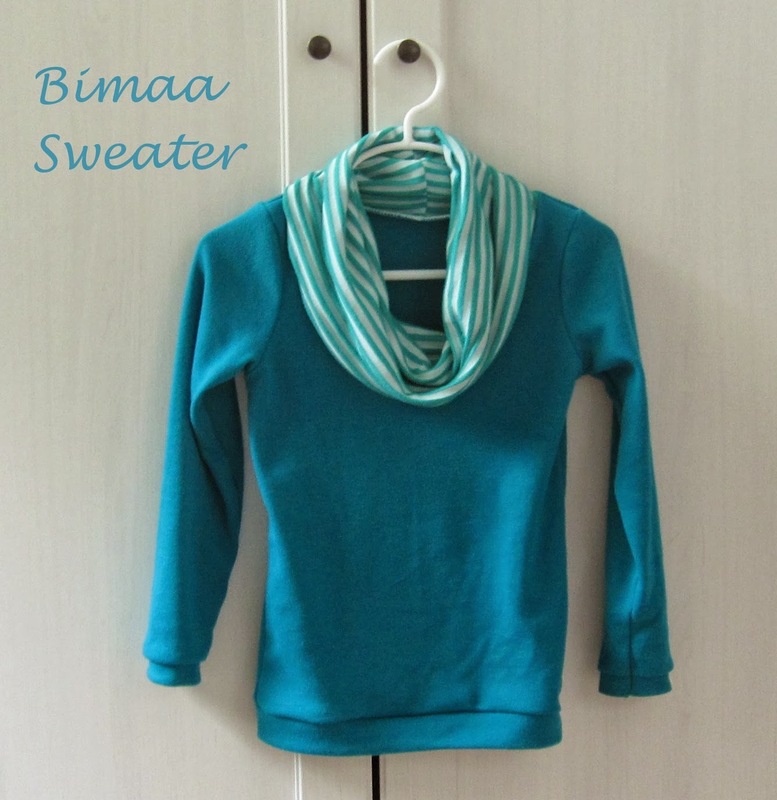 The Bimaa sweater is the exact look I wanted last year and I didn’t even know it, hehe. The cowl is deep enough that it hangs around the neck as if it’s an infinity scarf, which is so lovely. I used some more of the greenish-blue knit from my stash for the body of the sweater and a striped lightweight fabric from Girl Charlee for the cowl. The pattern is a quick sew and I was super impressed with how perfectly each piece fit its mate when sewing it together. I don’t know if that makes sense to you, but sometimes when I’m sewing I’ll find that the neck band is slightly too long, or (especially) the sleeve doesn’t want to fall in line exactly where it should without a bit of a gather at the top, but Sarah’s pattern pieces seriously matched up exactly. She clearly knows her math, hehe. I hope you guys aren’t sick of seeing Hosh pants yet, cause there’s going to be a lot of them around here this season. These are the tiny hearts version I made last week. It has been nice and chilly here lately; perfect fall weather. Until the end of last week and this past weekend when it shot back up to the 90s. Ugh. I am so happy to have some rain today and a forecast of 60s for the rest of the week. 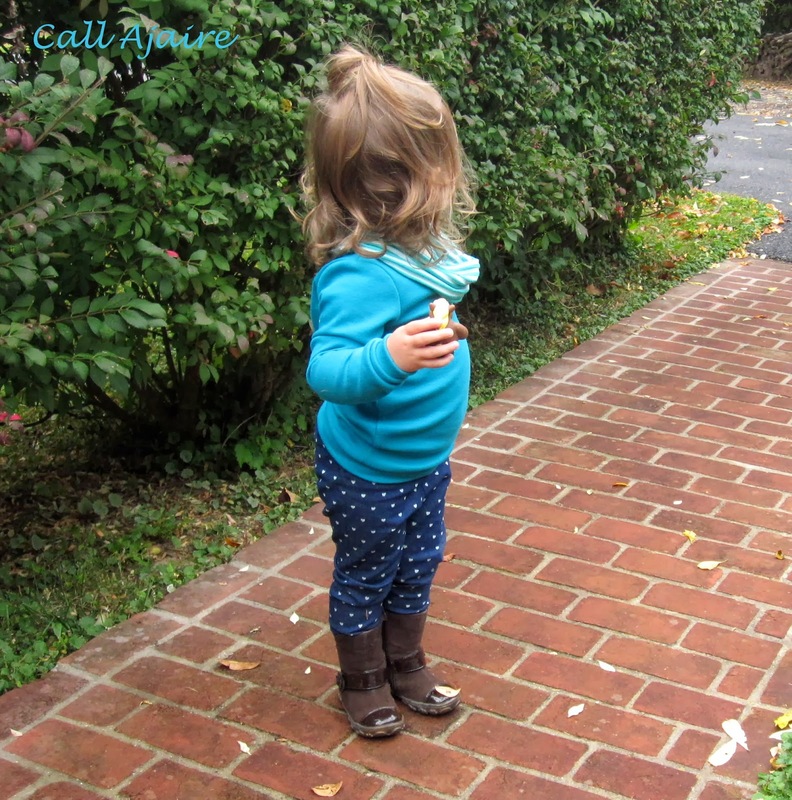 It’s fall in Maryland and we’re hoping to take advantage of the cooler weather and get a lot of hikes in this month. This sweater will keep Bean nice and cozy on a chilly day. This is how Bean prefers to wear her Bimaa. She thinks its extremely funny. Especially when she can get it all the way up to the top of her head, hehe. Here are the rest of the stops on the tour. Isn’t it an amazing lineup?? Also Sarah has generously offered to give away a Bimaa Sweater Pattern so just follow the rafflecopter instructions below for a chance to win! Gorgeous!! I have sewn up two bimaas for my tour spot!! Cute, cute, cute! I also like the Bimaa best. lol Love that last picture! I'm seriously in love with this pattern and have already made 2 and cutting out 2 more today! 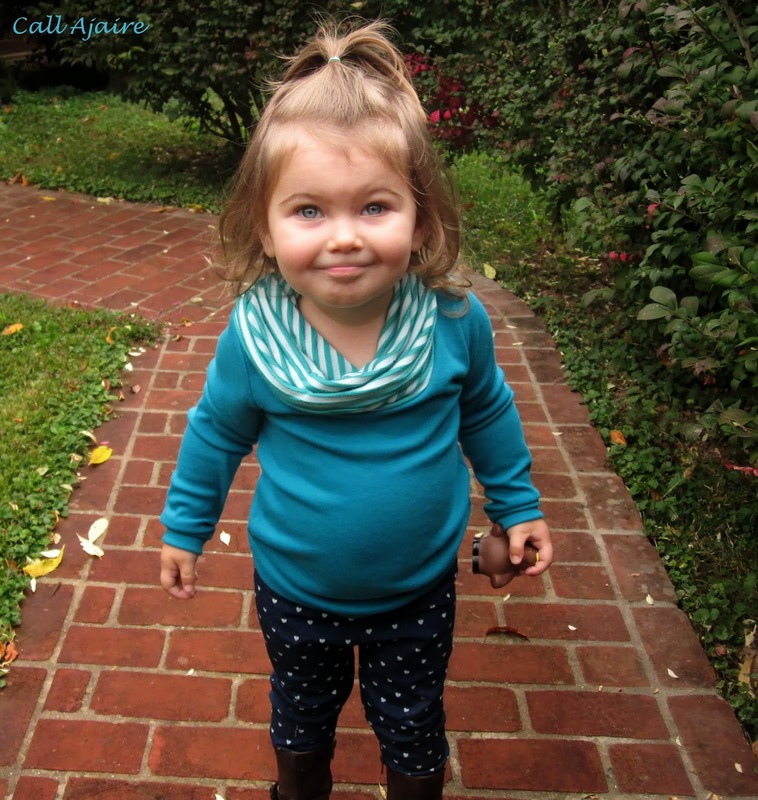 Your little bean is so adorable in hers!! So cute! I'd love to sew one! So cute! I love her little baby belly she still has! I don't know what's wrong with me that I still haven't sewn up a pair of hosh pants….never. enough. sewing. time! And, how am I just learning that your name is Allison?? I've been calling you Ajaire for 9 months! I've been loving seeing these pop up over the past week! I love your fabric combo and can't wait to make one up. 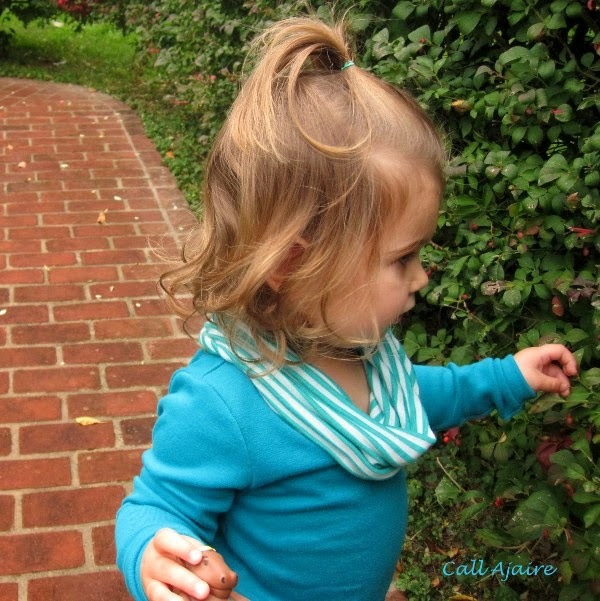 How adorable is this top and little Bean as well! I'm loving all these cowl neck versions I'm seeing around. And I think the Hosh pants are a favorite of mine. That is one sophisticated two year old! I've been admiring all of the versions, and yours is precious! So cute!! She looks adorable in her Bimaa! I just bought the Sew Fab bundle and can't wait to sew one up. I also now realize I need to get the Hosh pants pattern….your heart fabric pair are just too cute! These shirts are so cute…I have loved everyone's version…and yours too! It looks so soft & comfy!! 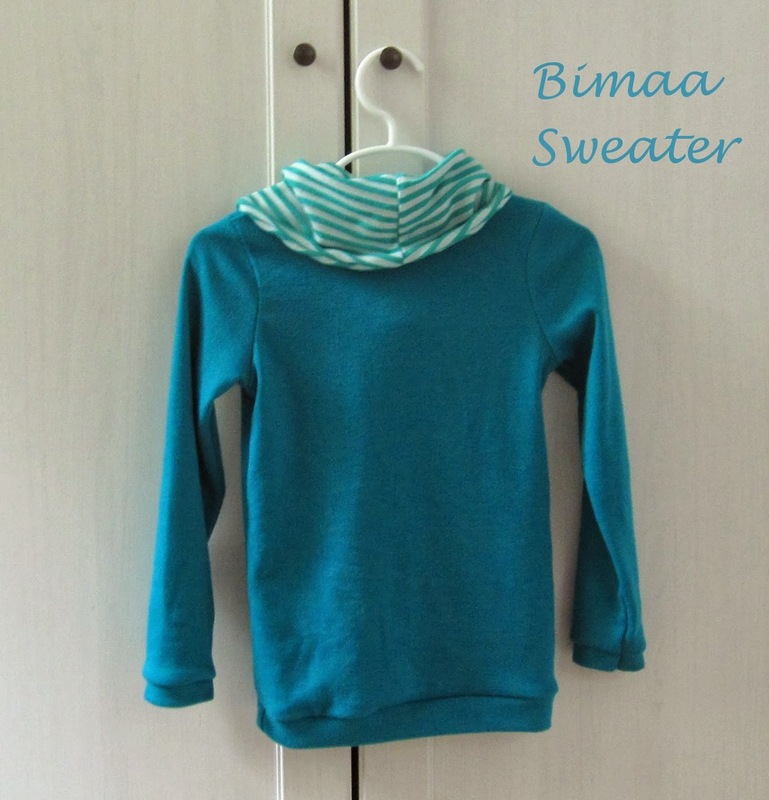 Hands down, my fav pattern is the Bimaa Sweater. Yours is super cute! Thanks for the chance! omg! the tummy on that bean 🙂 SO cute!!! love the bimaa too! I like the bimaa best! The Bimaa would be so cute on my kids! I've heard alot about the Bimaa from sewing groups I am in, and it is my favorite. The Hosh pants are cute too though! The Bimaa is definitely my favorite!